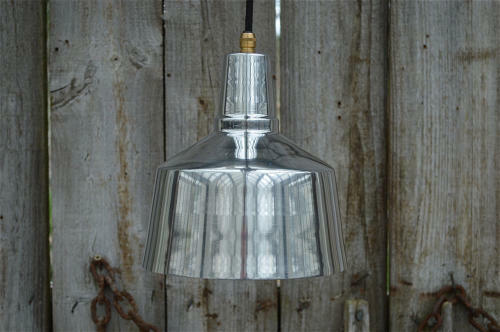 A cool looking retro styled modernist ceiling light.The shade is made from aluminium with a polished finish and comes supplied with a UK made brass E27 standard screw in bulb holder...21cms diameter and 21.5cms tall. 8 1/4 inches diameter and 8 1/2 inches tall. Please note no hanging wire or ceiling rose are included but we have a full range of colours and styles available in our shop. If you wish to hang from chains we also have hooks and chains available.